The Kabelwerk social housing project includes 1,004 housing units and wonderful amenities for the residents. Image courtesy of Pamela Lindstrom, Commissioner of the Housing Opportunities Commission of Montgomery County, Maryland. 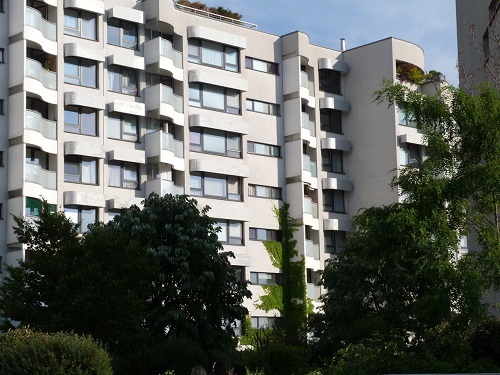 The city of Vienna, Austria, famous for its rich cultural and architectural heritage, is also recognized for its unique social housing program. In practice for nearly a century, Vienna’s social housing system is known as an effective and innovative model for providing superior, affordable housing to the city’s residents. The Vienna model was recently the subject of an exhibit in New York City hosted by the Austrian Cultural Forum that generated substantial interest among those in the U.S. working to improve the quality and accessibility of affordable housing for American families. The model showcases the innovation, creativity, and freshness of design with which well-known architects, working with different private sector developers, have helped to shape Vienna’s affordable housing. More recently, on November 12, 2013, the Housing Opportunities Commission of Montgomery County, Maryland and the Montgomery Housing Partnership hosted a discussion about this remarkable social housing program. The term social housing is used extensively in Europe to refer to government-owned or regulated affordable housing. A comparative study of social housing programs in European nations finds that they vary substantially — in their histories of origin, who they serve, where housing is located, the physical nature of the housing stock, the means of financing new housing, and even how their housing subsidies work. Vienna’s legacy of giving high priority to providing high-quality housing for the working class dates back to the “Red Vienna” period of the early 20th century, when the majority socialist government made providing quality affordable housing for city residents a priority. Vienna remains committed to this cause to this day. The November discussion in Montgomery County, Maryland was led by Pamela Lindstrom, commissioner of the Housing Opportunities Commission. Lindstrom explained that Vienna’s city government owns and manages 220,000 housing units, which represent about 25 percent of the city’s housing stock.1 These city-owned housing units, called social housing, are meant primarily for lower-income residents. The city also indirectly controls 200,000 units that are built and owned by limited-profit private developers but developed through a city-regulated process. Vienna adopted the latter approach in the 1980s, when it decided to collaborate with the private sector to build affordable housing rather than developing and owning more public housing. The city buys land deemed suitable for residential development and retains control over the type and nature of development. The city then solicits proposals from various private developers, which will build and retain ownership of the housing units. A jury evaluates these proposals based on four criteria: architectural quality, environmental performance, social sustainability, and economic parameters such as proposed rent levels and costs.2 After the jury selects a developer, the city sells the land to the developer at an affordable price. In addition, the city gives the developer a loan with favorable terms such as low interest rates and extended repayment periods. Private developers who collaborate with the city government to build affordable housing must allow the city to rent half of the new apartments to lower-income residents; the developer generally leases the remaining units to moderate-income residents. In some projects, future tenants participate in the planning, design, and construction process and give input on what kind of facilities they would like to have in the building. The Wohnpark Neue Donau housing project is built along the Danube river and consists of 850 apartments spread across one, two and three bedroom units. Image courtesy of Pamela Lindstrom, Commissioner of the Housing Opportunities Commission of Montgomery County, Maryland. Rents are regulated by the city government so that none of the residents pay any more than 20 to 25 percent of their household income for housing, compared to the corresponding 30 percent benchmark in the U.S. A unique feature of Vienna’s social housing program, Lindstrom noted, is that the city’s income restrictions for subsidized units only apply when families first move in. Residents are never required to move out, even if household income levels increase in the following years. This arrangement results in a substantial number of moderate-income residents living in subsidized housing, and this mixing together of residents with different income levels helps with social integration. Since the city has a large stock of affordable housing, these middle-income residents typically do not crowd out lower-income residents.3 Because the city continues to add new units that are subsidized, about 5,000 annually, and available to lower income residents, housing developments do not devolve into middle-class enclaves nor do they become stigmatized concentrations of poverty. Lindstrom highlighted some examples of social housing projects in Vienna including the Kabelwerk and the Wohnpark Neue Donau housing projects. Built on an old industrial site spanning about 7 hectares, the Kabelwerk social housing project has a total of 1,004 housing units spread across various housing types including subsidized rental housing, subsidized owner-occupied homes, apartments for refugees, and student housing. The development includes amenities such as shops, restaurants, a kindergarten, meeting rooms, and a rooftop pool which enhance the quality of life for the residents. Wohnpark Neue Donau is built along the Danube River over an underground expressway. Consisting of a total of 850 units that vary from subsidized rentals to free-market penthouses, the housing blocks are arranged diagonally, which distributes the building’s load over the expressway deck and provides the apartments with a river view. The buildings are designed in such a way that they step down towards the river, which creates rooftop terrace apartments, and residents enjoy a nearby residential park. The development features one, two, and three bedroom units, and the ground floor units have wall-enclosed private gardens that are especially suited for families with children. Nearby amenities (shops, a school, a church, a kindergarten) mix with office high-rises and other residential neighborhoods — all part of a master plan by architects Adolf Krischanitz and Heinz Neumann. 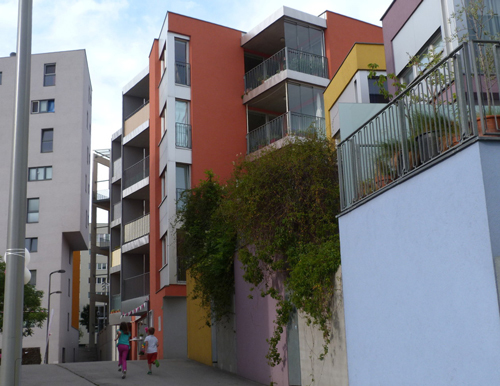 Vienna’s innovative social housing projects demonstrate the city’s commitment to affordability, high-quality architecture, energy conservation, and resident participation. In addition to other infrastructure systems and facilities, the effectiveness of the housing program has helped in making the city one of the most livable cities in the world, as judged by The Economist and Monocle in 2012, and as the city that offers the world’s highest quality of life, according to Mercer’s Quality of Living survey for the past four years.